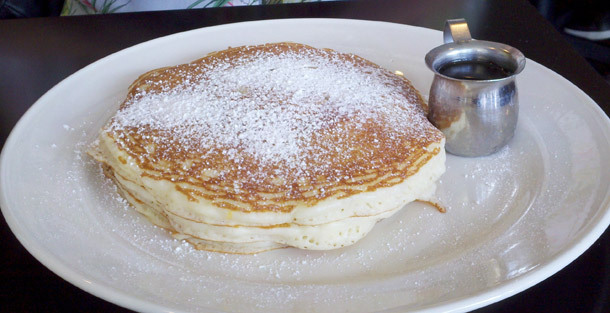 Ma’amCakes’ Piece About Pancakes is Featured Today on Zooey Deschanel’s Website, HelloGiggles.com! Check it Out! Life at a Crossroads? Eat Some Pancakes. You lost your job because of the economy. 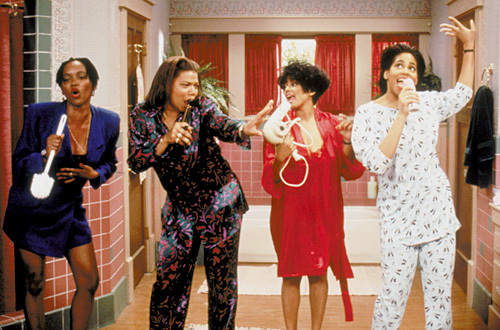 You just broke up with your boyfriend, and your best friend is getting married Saturday. You graduated with an MBA, but have no career path. 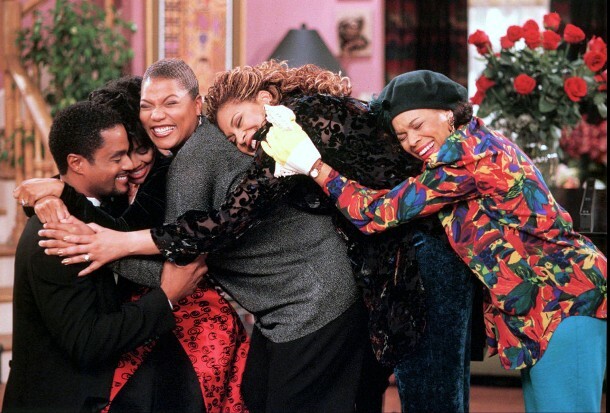 When all the nosy-bodies approach you during these challenging moments and ask the dreaded question, “now what,” on a scale of one to ten: how badly do you want to smack these uh-noying question-askers? Well, before receiving a law suit on top of everything else, let’s put our hands to better use and grab a plate. Pancakes are the best meal to deal with life’s crossroads because they cater to all food types, and also represent the opportunistic path that lies before you. When the yearn to stuff your face with crap during a breakup finally hits, pancakes are a great fix because there is such a rich variety of this comfort food. As per my pancake blog, Ma’amCakes, like that of a Starbucks menu you can find all types of pancakes that cater to your vegetarian, vegan, low-cal, low-soy, hipster diet, so you can stay healthy while dealing with one of life’s many challenges. Based on my breakfast experiences, I’ve found the abundance of varying pancake concoctions to be almost metaphoric of the different flavors of men out there, who could be potential boyfriend material. 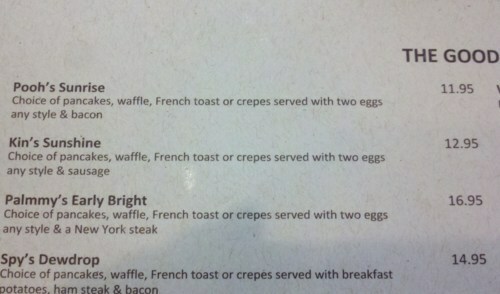 Perhaps the diverse pancake menus represent the possibility of a new job, one in which you may never have even considered. Or maybe the truly out-of-this world pancakes – like the “Scotch on the Rocks” pancakes at The Griddle Café – symbolize your ability to follow a career path that’s off the beaten path. 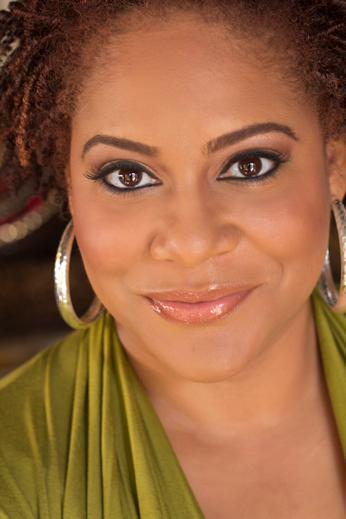 When you’re at a road block, skip the “what’s next” question, and follow your own vision and creativity. Get messy! Why shouldn’t you? 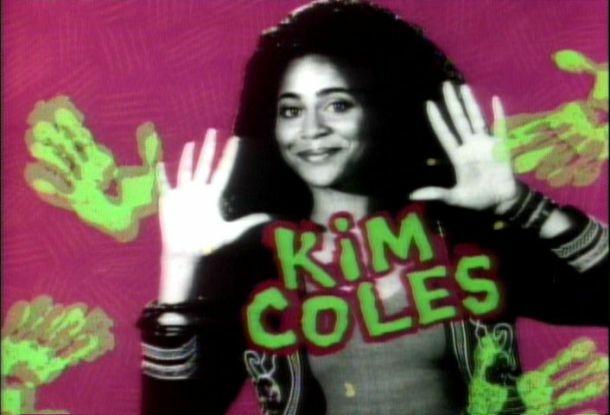 Life is! And when your mom says “don’t play with your food,” you go ahead and play. You know Betty Croker did. So get out there, and grab a fork. And when life hands you lemons, make some Ma’amCakes. 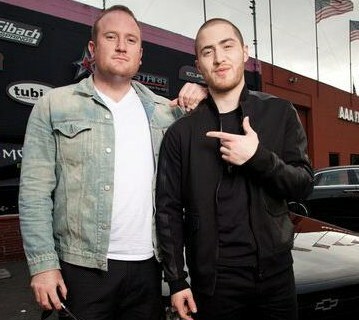 Mike Posner Hits Posted my Review on their wall, Check it Out! 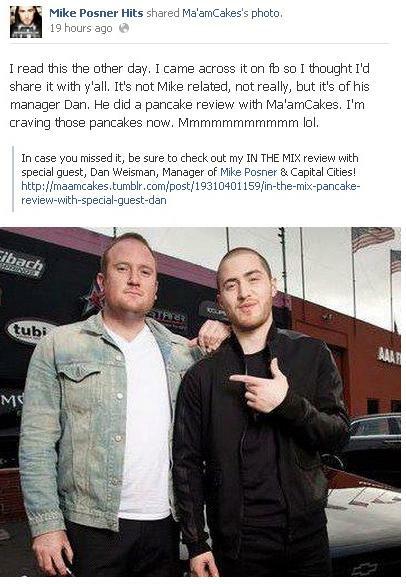 This weekend I was super fortunate to have Dan Weisman – Manager of Mike Posner and Capital Cities/Music Manager and Director of Music Marketing of SkullCandy – join me as a guest reviewer for In the Mix. Whew, that was as much of a mouthful as the pancakes! Yes, I know what you’re thinking: I’ve already reviewed at Bea Bea’s! 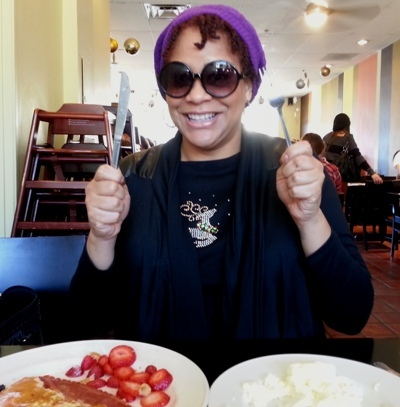 BUT, when Dan requested we go for pancakes with some gluten-free options, I knew a spot that had a lot of gluten-free options – and good ones, too. 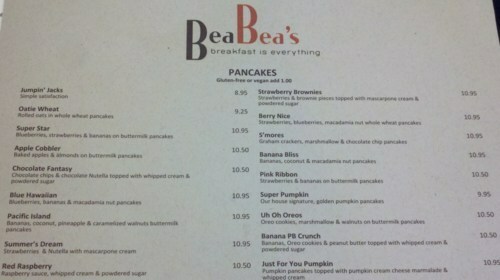 As a reminder, below is a list of pancake-options from Bea Bea’s, ALL of which can become gluten-free for just $1 extra! 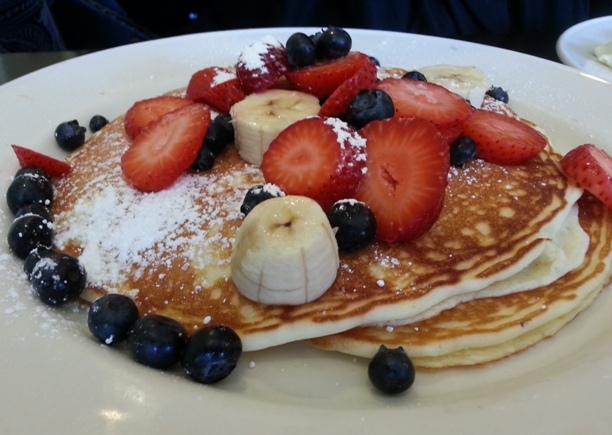 When viewing the menu, Dan’s initial reaction was “Wow, this is probably the most amount of gluten-free pancake-options I’ve seen in LA – and I’ve been to a lot of spots!” Dan then recommended Square One, Bread and Porridge – both of which I’ve never heard of, but am adding to my list! – and John O’ Groats, which I’ve actually already reviewed. “While I am more of a Waffle guy,” Dan admitted, “I wanted to try a new pancake place.” Well fortunately Dan, with Bea Bea’s, you’re in great hands. Dan ordered a sausage and egg breakfast, and for our final decision on the pancakes: as Ma’amCakes was feeling a bit full from all the recent reviewing, Dan and I decided to split the Super Star – Gluten Free. 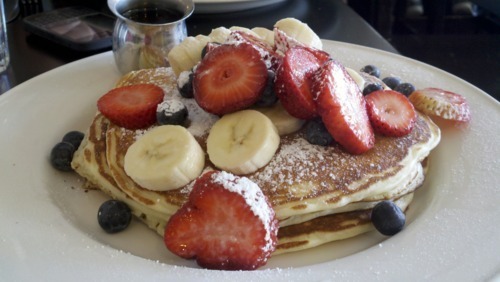 This red, white, and blue all-American breakfast was the perfect way to begin a beautiful March morning in Los Angeles – well in this case, Burbank. The texture, savor, and fluffiness of this meal was simply: refreshing. As Lesley-Anne stated in my Hugo’s In the Mix review, gluten-free pancakes “don’t make you feel so bloated.” In the case of the Super Star Pancakes at Bea Bea’s, this was definitely the truth. For me, the best part about this pancake-option, besides the freshness of the fruit, was that it barely needed any syrup. This review was a bit challenging for Ma’amCakes, as it was the first time I’d received a gluten-free breakfast request. 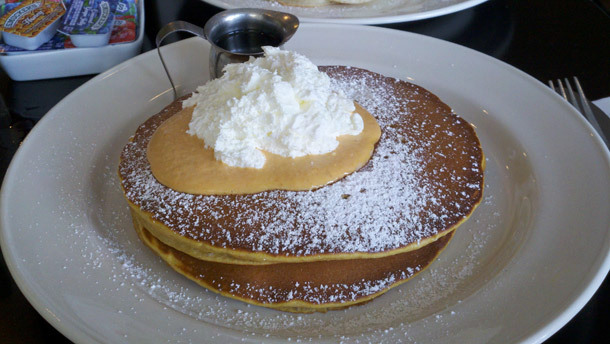 It’s important to note that Bea Bea’s caters to this necessity – as well as vegan – for all those who desire to enjoy pancakes like the rest of us, but don’t necessarily have the luxury. Thank you so much, Dan, for being a part of Saturday brunch with Ma’amCakes! And be sure to check out Justin Bieber’s new single “Boyfriend,” which Mike wrote and produced! Check out Bea Bea’s Reply to My Review! On Saturday I visited Bea Bea’s on Pass Ave between Oak St. and Alameda in Burbank, CA. The slogan on both their storefront and menu, “Breakfast is Everything,” is a perfect description of the class, creativity, and savor Bea Bea’s puts into their food. While I wasn’t quite in the mood to trek all the way to Burbank for breakfast, the drive was beyond worth it. The menu above pretty much speaks for itself. For a pancake-lover to attempt to choose only one dish off Bea Bea’s menu, is like asking a child to select their favorite toy in FAO Schwarz. 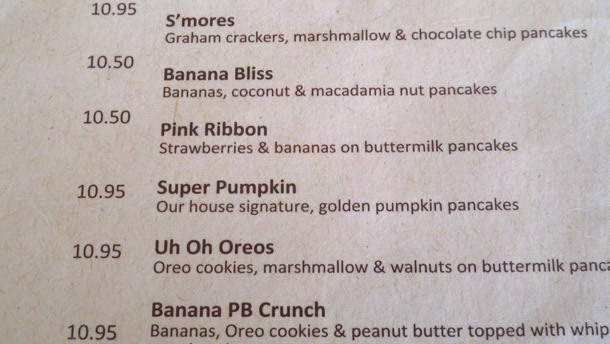 Our server mentioned their most popular pancake was in fact the Just For You Pumpkin; but while I was debating between the Super Star, S’mores, Pacific Island, and Banana PB Crunch, I ended up choosing the Summer’s Dream. It was at this point I combined the Summer’s Dream with Pooh’s Surprise, a dish I’d like to coin the phrase for: Dream Pooh. Props to Bea Bea’s for this opportunity- not all restaurants allow you to combine a specialty pancake with an egg breakfast. If at all, you’ll typically find this option with plain-pancakes only. Summer’s Dream was pure decadence. 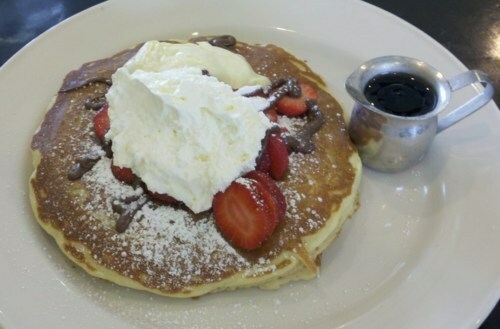 Although I am a fan of Nutella (a topping typically more popular on the east coast) I’ve never had this with pancakes. The breakfast was a wonderful combination of flavor and texture. The best part about this dish was that each item was just as amazing by itself, as it was together. The pancakes themselves may be the best pancakes I have ever had- and considering this is my second review, the bar has now been set pretty high. The pancakes are doughy, but not too filling, and cooked just right. As if they were just picked from a field and placed on my breakfast, the strawberries tasted incredibly fresh. And the Nutella was the perfect topping to this specialty breakfast. My only additional comment is that while I’d never before had mascarpone cream- this tastes like whipped cream combined with cream cheese- I’d say the dish needs way less than the scoop provided. When putting a small dabble on my bites of Summer’s Dream, I realized it was all I needed- if that, at all. The dish in itself is wonderful- and filling- enough, and I felt the addition of the mascarpone was in fact, too much. 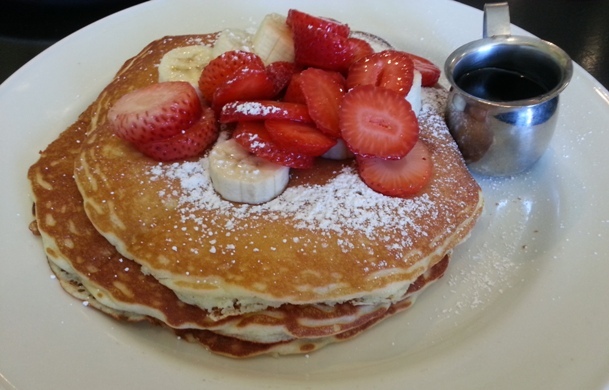 All in all, Bea Bea’s may officially be my favorite pancake stop in Los Angeles. The staff is incredibly nice, and while there is usually a slight wait for a table, the food comes quickly enough. Also, the option for gluten-free and/or vegan, makes Bea Bea’s even more special; this is certainly an option that not many restaurants have. The drive to Burbank is well worth it, and Bea Bea’s got it right: Breakfast IS everything.